Brynne and Joe are my clients from my hometown in Michigan. They first hired me a few weeks after their courthouse wedding to take some photos in their wedding attire on the beach. We hung out on the beach and chatted about traveling until long after the sun went down. I love when I get to have those kind of moments and conversations with my couples. Connecting with my clients this well is one of the best aspects of my job . 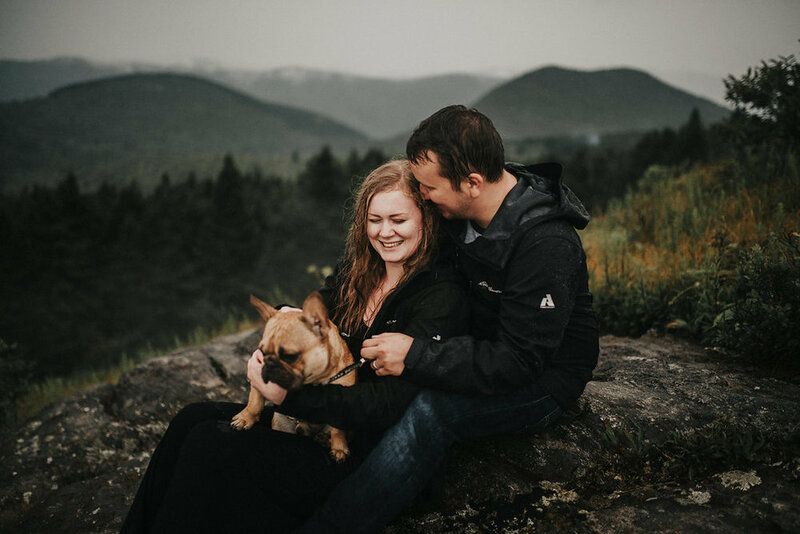 A few months after I moved to the Blue Ridge Mountains, Brynne and Joe contacted me to say that they were planning a road trip and were thinking about coming to see me for some couple’s photos in the mountains with their Frenchie, Artoo. These two would later inform me that Artoo was basically their child. I can always appreciate that kind of love for a family pet. 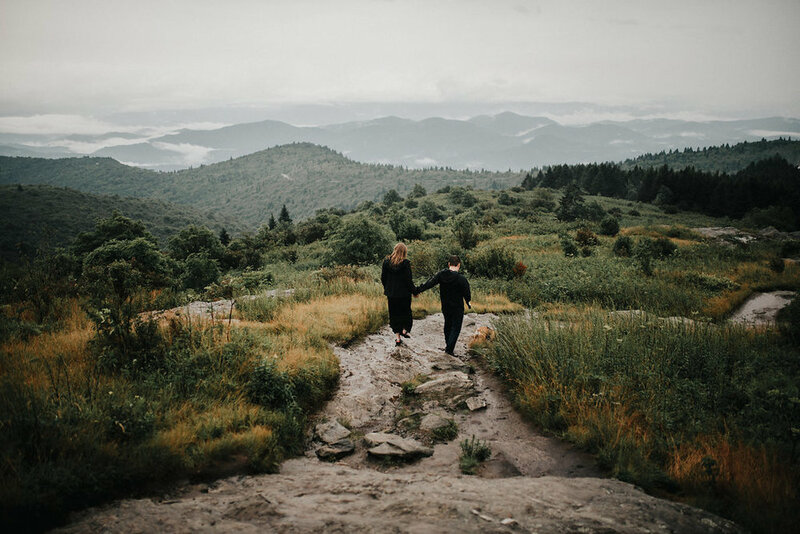 Joe and Brynne were only in Asheville for a short amount of time and as a matter of course, the day we planned to hike up to Black Balsam Knob, the weather was inclement. To say it was raining would be a drastic understatement. It was a torrential downpour. We decided to take our chances and make the drive up the mountain despite the rain. There is always a chance that the rain will let up and I like to take those chances if my clients are willing to as well. When we got to the trailhead we sat out the pouring rain in our cars for a while. The rain did not seem to want to let up. I ran out to their car parked behind mine and asked if they wanted to try and reschedule or brave the rain and make the hike. They chose the more adventurous route which I am always totally game for. I love the moody vibe that the rain brings to the photos. They came prepared with raincoats and I had packed two umbrellas. I successfully managed to keep my equipment dry while holding the umbrella in one hand and camera in the other for the duration of the photoshoot. 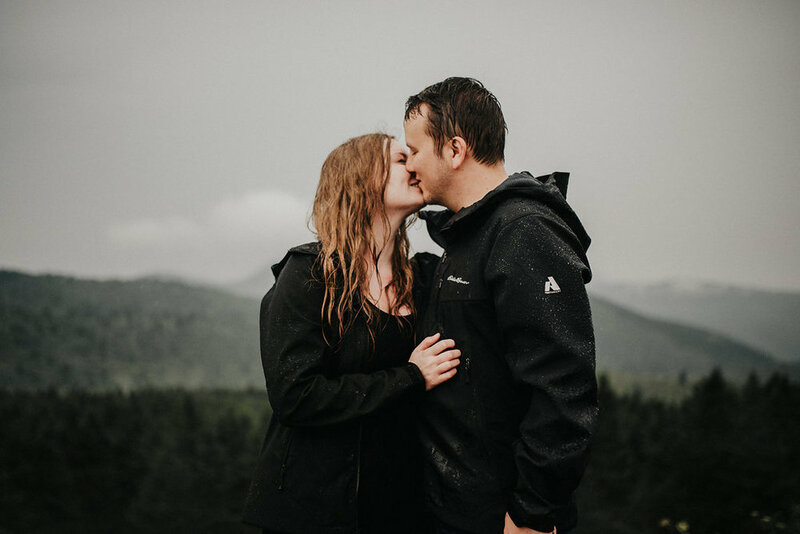 I love that these two could embrace the weather that mother nature bestowed upon us that day because these are some of my favorite photos. Artoo was the perfect little dog model and seemed to enjoy the adventure as well. Sometimes it is better to take your chances and roll with the punches during these shoots as you never know how they might turn out and what surprises they might bring.